Ruffles, ruffles and more ruffles! Sugar n Spice Doll All Spice (other flavours available!) 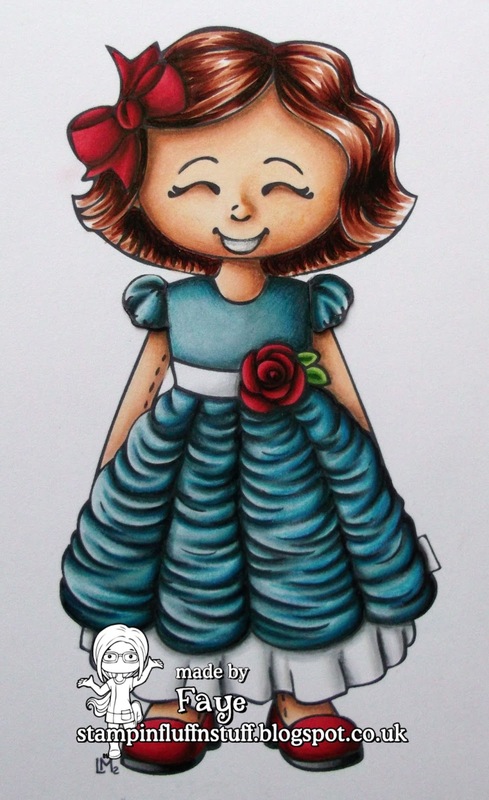 here, is a new image from Little Miss Muffet Stamps. Oh, sorry. Disclaimer Alert! So, as I was saying, bizarrely, considering how much pleats and folds strike fear, deep, deep, into my heart, I took one look at All Spice's dress, and decided I had to colour her. The Fluffster of old, would have been running for the hills. Ok, I'll go take my temperature in a moment. How could I not have seen your blog earlier - sooo beautiful coloring, and I love the design of your cards! As always great coloring Faye!! It's always a pleasure to see your creations!! Wow! Amazing. I cannot believe you were afraid to color ruffles. You've certainly overcome that and then some! Again, Wow! Wow WONDERFUL!! I am definitely intimidated by pleats, still learning that technique! Love how you have colored her....awesome!! Wow, Fluffy, your coloring of the ruffles really is breathtaking...brilliant! Gorgeous image and beautiful colouring. She is such a sweetie and your colouring is just perfection! Gorgeous. Loving all the ruffles. Hugs Muver. Stunning colouring Faye, LOVE IT! Look at those pleats, they look so realistic! Love those bling and sequins too, great colorful additions to this clean design. Well then... the new fluff has so mastered folds and drapes.... cos this is bloomin wonderful - and the perfect CAS layout shows her off to perfection!